Most MindManager (MM) users are acquainted with the program’s Power Filter feature, which provides a facility to show, hide or (from MM2017 onwards) fade topics which match filter criteria. However, a lot of people overlook the Power Filter’s close cousin, Power Select – and even if they are aware of its existence they fail to recognise its usefulness. Power Select dates back at least to version 7 of MindManager, but unlike the Power Filter which has its own icon on the Status Bar it remains comparatively hidden. 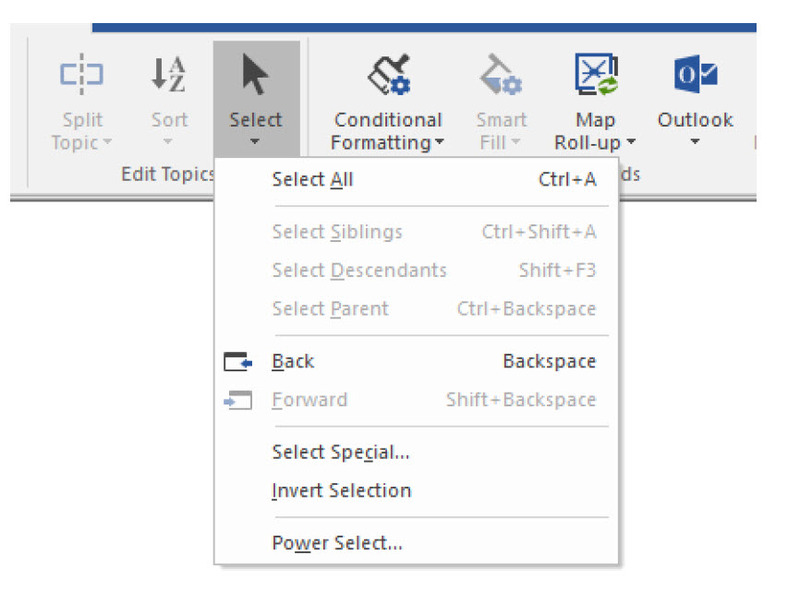 Power Select does not even get its own spot on the default ribbon – it is found at the bottom of the drop-down menu in Select under Edit Topics on the Advanced tab. Clicking on this brings up a dialogue box which is very similar to its Power Filter equivalent and operates the same way – in fact Power Select will remember the last set of criteria created in Power Filter, and vice versa. However, instead of showing (or fading or removing) topics which match the chosen criteria, Power Select merely highlights the matching topics – or the non-matching ones, depending on which option is chosen. This may not seem that remarkable, but this facility brings some advantages. It is helpful sometimes to see and work with selected topics in the context of the whole map with all other topics being visible. 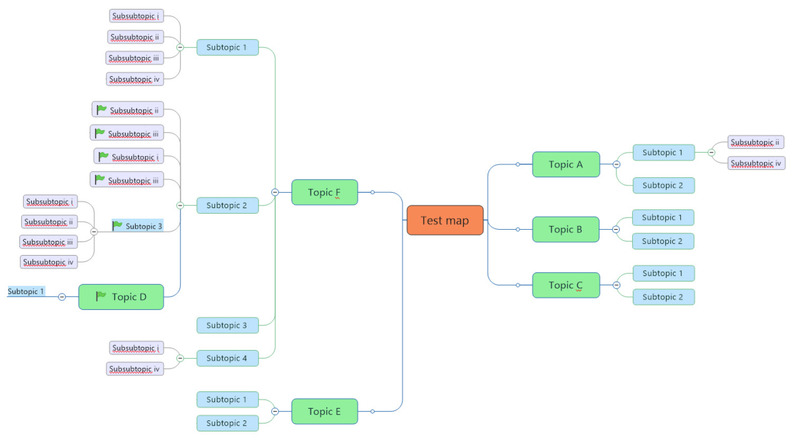 Markers and formatting such as fill and font colours can also be applied to the selected topics and their effects more easily assessed if the rest of the map isn’t hidden. There is another task for which Power Select can be more useful than Power Filter – copying, moving or even deleting selected multiple topics which don’t have anything in common. Of course, topics can be selected directly for these operations, but it is easy to make an error, for example leaving a topic out or accidentally attaching a group of subtopics to the wrong main topic. Turning the selection and the copying or moving of topics into a two-step process makes this process more reliable. It is also a lot easier if the rest of the map is visible. Moving selected topics to a new location is a good example. First, go around the map and mark the topics concerned with a flag or icon which is not otherwise being used. Unlike direct selection and moving you can take your time and you don’t have to hold down the CTRL key while selecting topics it. Then, go to Power Select and clear any existing criteria in the dialogue box. Go to the Markers tab and tick the appropriate box for the flag or icon you used and then click the select button and then choose Select Matching topics. All the topics with the flag or icon should now be highlighted. Click on Cut, select the new parent topic and then paste the selected topics in their new home. You can now remove the flag or icon you used simply by deleting it in the Map Index. Thank you! Excellent lessons as usual!